Understand Want to know more? 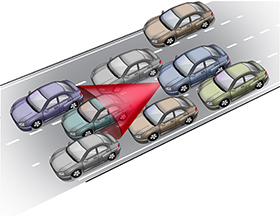 Deepen your understanding of Adaptive Cruise Control. Challenge Up for a challenge? 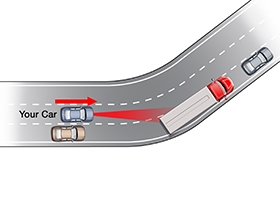 Tackle a few challenging scenarios using Adaptive Cruise Control. Play Ready to tinker with Adaptive Cruise Control? Try out plAyCC to see if you can figure out what makes ACC tick. 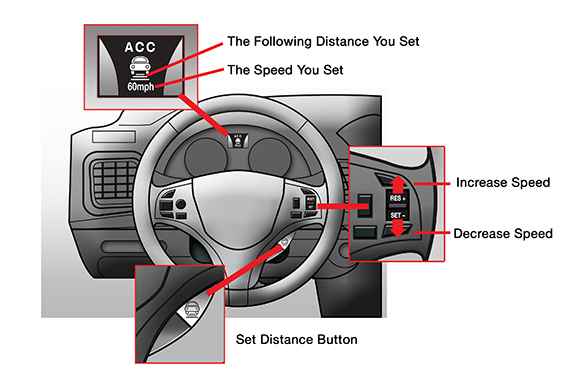 Conventional Cruise Control can maintain a steady speed that you set. 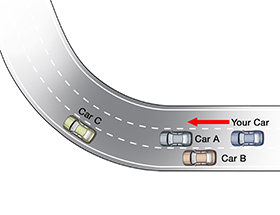 Adaptive cruise control (ACC) is an enhancement of conventional cruise control. ACC automatically adjusts the speed of your car to match the speed of the car in front of you. If the car ahead slows down, ACC can automatically match it. Once the car ahead moves out of your lane or accelerates beyond your car’s set speed, your ACC allows your car to return to the speed that you have set. Other than setting your speed, you only need to turn on the system and select your preferred following distance. The specific controls will be different depending on your particular car type, but usually you will have to start by setting a cruising speed and a following distance to the car ahead. Most systems are operated by controls on the steering wheel. You can also intervene at any time by use of the brake or accelerator pedal. You can set the speed using the +/- speed button. You can also accelerate as normal until the desired speed is reached. Then you press a button to have the ACC “remember” the speed. Most ACC systems will work down to about 25 MPH. 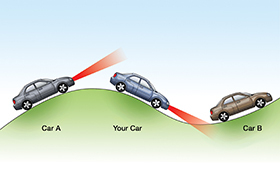 ACC systems allow you to set a following distance, or time interval, between your car and the car ahead. 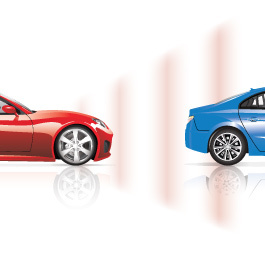 ACC systems provide various car-to-car distance options, such as: short, medium, or long distance. You can change the setting at any time as traffic conditions change. A longer setting is recommended for most driving. Like standard cruise control systems, ACC keeps your car at the speed you set, as long as there is nothing in front of you. 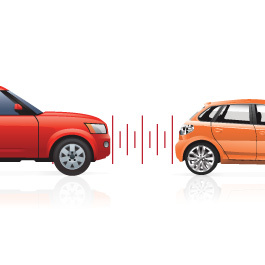 A sensor unit is added to determine the distance between your car and other cars in front you. Speed and distance sensors. 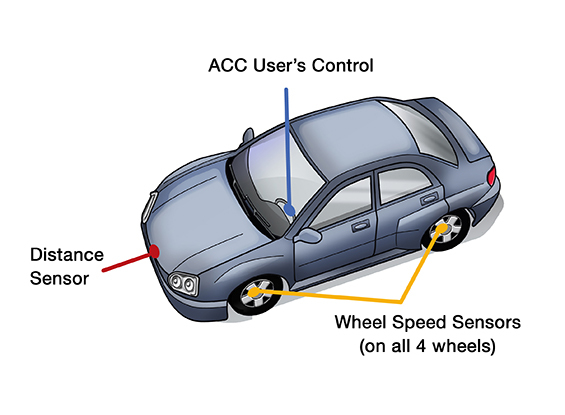 ACC uses information from two sensors: a distance sensor that monitors the gap to the car ahead and a speed sensor that automatically accelerates and decelerates your car. 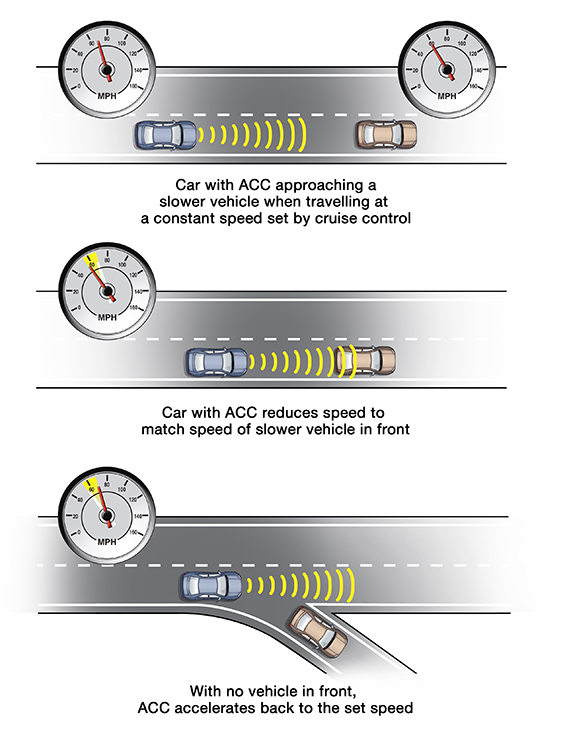 ACC uses information from these sensors to adjust your speed and maintain the set distance from the car in front of you. Looking under the hood: Radar-based systems. Let’s take a look at one ACC technology: radar-based ACC. 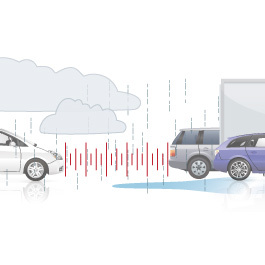 Some ACC systems send radar waves that reflect off objects in front of your car. Based on the radar reflection, ACC uses distance, direction and relative speed to detect if the car is within the distance you set. ACC predicts the path of your car and then decides whether any of the vehicles ahead are within your set distance. Your ACC system looks directly in front of you for other vehicles. Because it only looks forward, your ACC system may have trouble detecting traffic on curving roads. In the image to the right, see how ACC’s field of view works when the road curves. Its view may include traffic in another lane. It may also miss vehicles in your own lane. In situations like this, your ACC system may not react appropriately to the traffic around you. In the example, your ACC system may unexpectedly slow down if it detects the semi in the other lane. Look at scenario in the image below. Imagine yourself driving the blue vehicle. Think about the questions shown below. As you approach the curve, how might your ACC system respond? How might your ACC system respond? When Car A goes around the curve, my ACC system may not detect it and the system may unexpectedly accelerate. How should you respond? If my system accelerates, I should maintain a safe speed manually until the road is straighter. Just as your ACC system may struggle with curving roads, it may also have trouble on hilly roads. ACC looks straight in front of the vehicle, and can’t bend its view up or down hills (or around curves). The image shows how the system’s field of view may not see everything when on a hilly road, and may respond incorrectly. In the example, your car’s ACC system may not detect Car B, and could unexpectedly speed up. As you approach the top of the hill, how might your ACC system respond? How might your ACC system respond? When Car A goes over the hill, my ACC system may not detect it and unexpectedly accelerate. How should you respond? If my ACC system accelerates, I should disengage ACC and maintain a safe speed manually until the road is less hilly. ACC systems detect other vehicles directly in front of you. 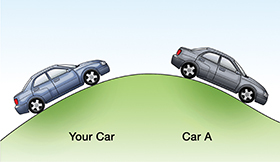 Because of the system’s field of view, ACC may not detect a vehicle that is in your lane but not directly ahead of your car. 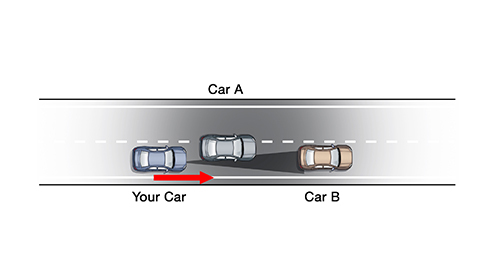 This can include vehicles that are merging into or out of your lane. 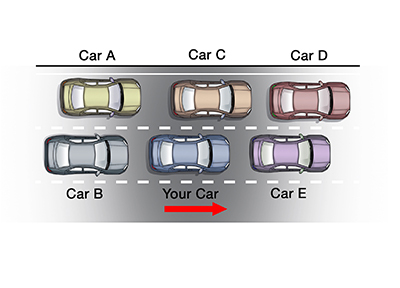 In the example, Car A may be outside of your ACC’s field of view and yet still in front of you. Look at the scenario in the image below. Imagine yourself driving the blue vehicle. Think about the questions shown below. How might your ACC system respond? How might your ACC system respond? If Car B moves into its field of view too quickly, my ACC system may brake unexpectedly or shut off. How should you respond? I should monitor the system and traffic, and take control manually if necessary. ACC systems can help regulate speed in traffic, but they may struggle in heavy traffic. Your ACC system has to detect a vehicle and also judge its distance and speed. 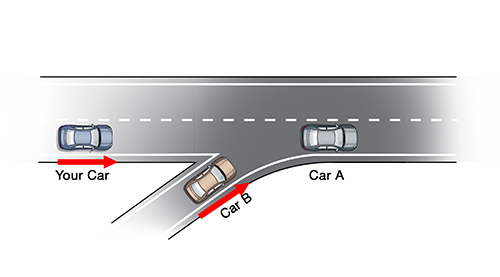 Quick lane changes and braking in heavy traffic situations may cause the system to struggle. In slow traffic, many systems will disengage below a certain speed. Look at scenario in the image below. Imagine yourself driving the blue vehicle on the freeway. Think about the questions shown below. How might your ACC system behave in this situation? How might your ACC system behave in this situation? Since many ACC systems are not designed for travel at less than 25 mph, the ACC system may turn off in a slow, heavy traffic scenario. How should you respond? Use ACC in conditions where you can drive greater than 25 mph.